This week was full of irony, sickness, sales and notes to self. Hopefully you’ll get some takeaways from this too! Note to self #1: Sometimes you won’t feel like it, but go anyways. The other day I needed to run some errands and I really, REALLY didn’t want to stop into my neighborhood Goodwill store, but it was on the way. I hadn’t been in the store for a few days and I’ve been trying to go 2-3 times a week, and, did I mention it was RIGHT on the way. Okay, I should just pop in for a few minutes. I just should. So at the 9:00 a.m. store opening I held open the door for a mom and her toddler and then went in. We weren’t the only ones heading in. A few other pickers came in including Bluetooth Joe (my nickname for him as he always seems to be nattering on his Bluetooth). He sprinted to the dish-ware aisle ahead of me and started looking. NUTS. That’s where I always start. Does he look for the same things as me? I’ve never figured this out. But I didn’t want him distracting me, so I decided to start in a different area and headed to the artwork section. Well, I’m glad I did. I found this wonderful 1959 painting by F.G. Houston that had been put out the day before! 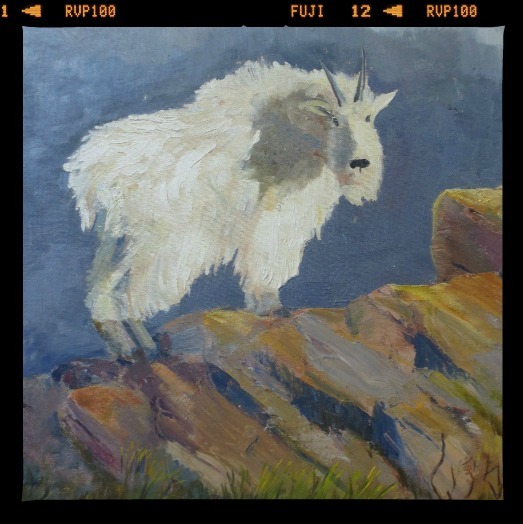 It took me all of five seconds to know I was buying this beauty…a shaggy mountain goat perched on rock. 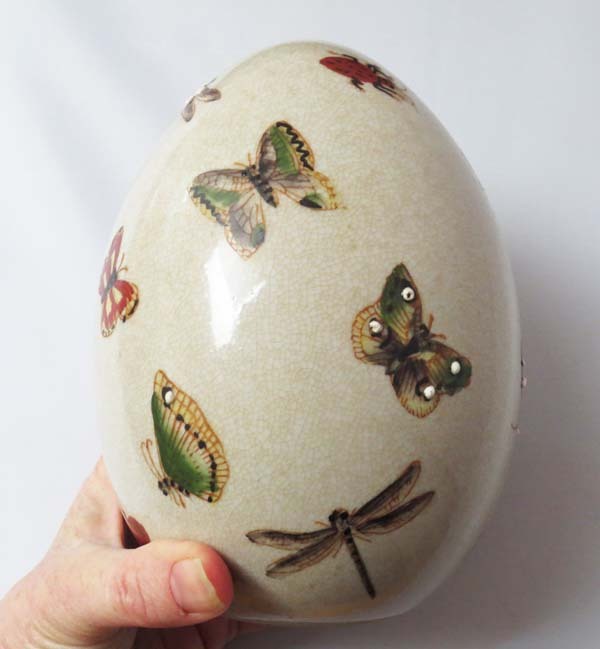 Here’s an arty-farty partial view of it, cropped and without the gold wood frame showing. 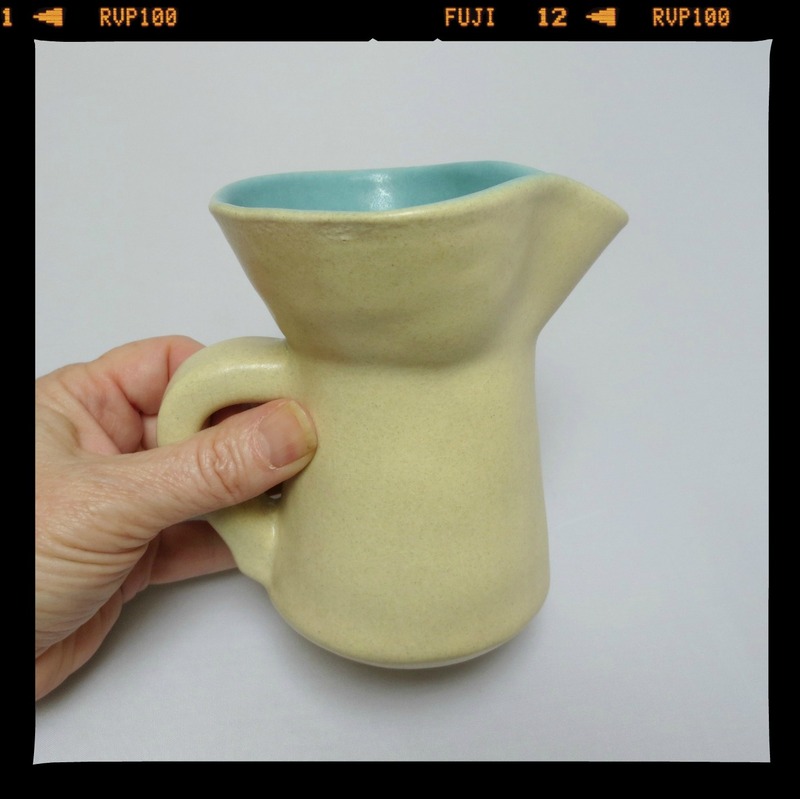 And I also found this old Winfield, Pasadena, pottery creamer/jug. In my online research I have found other jugs by this company (1929-1962) in these colors, but not in this style. It’s hand etched 89 on the bottom and I haven’t found any others from this company with that number. I’m wondering if it couldn’t be a prototype model for the company? At least it seems rare-ish! So I was in and out of the store in 10 minutes or so with two good finds on a day when I didn’t want to go! Note to self #2: Sometimes you’ll want to go, but shouldn’t. So don’t! Was planning to go to this fabulous rummage sale held monthly by our children’s hospital. 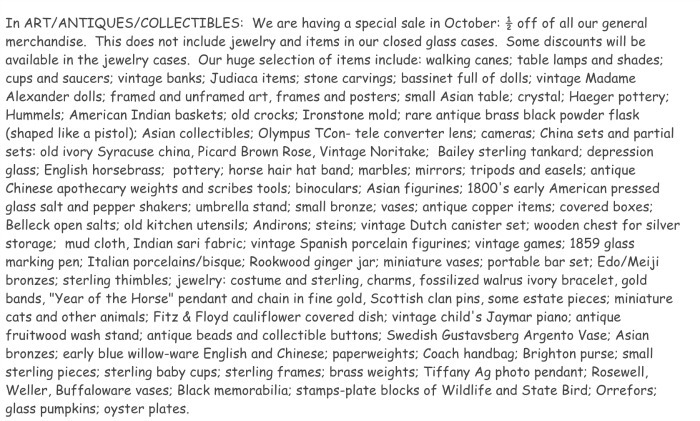 Not only did they have tons of antiques and vintage things, but most of them were going to be half price this month!!! So I was really, REALLY excited about going to this sale. It took me a good hour of back and forth interior monologue on the morning of the sale to realize that I wouldn’t be doing myself, or the others around me, any favors by going. And most of the women who volunteer as cashiers at this sale are elderly. I would feel awful if any of them got sick because of me. Note to self #3: Keep listing. They will buy. October has been a slow month for sales, but I’m not the only one. It’s been a topic of conversation on the Etsy subreddit. Lots of hand-wringing going on for many shop owners. But like them, I’ve kept plugging away at adding more things to my store and, thankfully, the dry spell has broken and I’ve sold six things in the last few days, including a book for $85, that I bought for $3. Note to self #4: Buy (and sell) what I like and believe in. For me, it’s not just about selling whatever will make money. It’s about selling stuff that resonates with me. Whether is a wonderful piece of Victorian jewelry, WWII memorabilia, a collection of black and white snapshots, a cool ’50s ashtray or a vintage Pendleton jacket. Okay, I know this is not a sound business strategy, but this is the way it has to be for me. For this reason I am starting to cull inventory items that never resonated with me. And my loss could be your gain! If no one else has put in a claim yet, I’ll take the egg!! It resonates with me!